Heat oven to 350 degrees F. Place pork in shallow roasting pan. Blend Italian salad dressing mix, cumin and oregano in small bowl. Sprinkle half of seasoning mixture over pork; cook uncovered for 1 to 1½ hours or until meat thermometer shows the internal temperature has reached 155 degrees F.
While pork is cooking, coat a separate baking dish with vegetable cooking spray and add vegetables. Sprinkle remaining seasoning over vegetables. Cover and roast in oven for 30 minutes. Remove cover, stir and continue roasting 15 to 30 minutes until vegetables are tender. 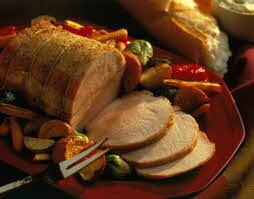 When pork reaches 155 degrees F. internal temperature, remove from oven and allow to rest 10 minutes. Mediterranean flavors and fall harvest vegetables complement this succulent pork roast. This tasty dish is a cinch to prepare and is sure to satisfy any appetite. Younger kids can help by setting the table and older kids can wash and chop your family’s favorite veggies. Top crusty bread slices with herbed butter or honey to complete the meal.